HASK Oil Treatments are made with the highest quality of nutrient-rich ingredients and are suitable for all hair types and and textures. The collection features two formulas – Monoi Coconut Oil and Argan Oil, providing hair with shine and hydration, minus the grease and weight. I religiously used VO5’s hot oil as a young girl growing up. I didn’t have the greatest strands of hair. And since I’ve been a die-hard Hask supporter ever since they’ve entered our SA markets, I didn’t hesitate to give their hot oil a try. Firstly, the stuff is amazing. It does exactly what you’d expect it to and the instructions on the packaging are so easy to follow. In fact, the ampule is quite large so I manage to treat my hair twice from the same ampule. Secondly, it is affordable and since I’m getting two treatments out of the deal, it’s even better than affordable. It’s a steal! And thirdly, I really love that one is able to store the remaining contents until next time. The packaging allows you to break off the tip of the ampule for your first usage and then just by using that same tip (in reverse), you’re able to save the goodies in your bathroom cupboard without any fear of the last of them being spilled out. Every time I see it on the shelf, I buy it. I’d rather have too much than none at all. 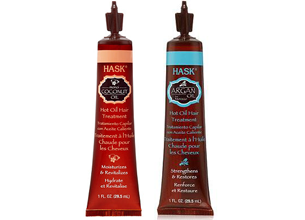 My daughter’s hair was severely damaged after a perm, but after we started using the HASK hot argon oil, there has been a significant improvement in the texture and her curls are a lot softer and manageable now. Excellent product at a great price! This product is absolutely amazing, use it once and you will never stop using it, it leaves your hair silky smooth and looking healthier than ever. The last few month’s weather conditions have taken a toll on my hair. It became dry, damaged and very brittle which started to fall out. While browsing through the aisles of a Clicks store, I came across the Hask Hot oil. Since the purchase, the first treatment left my hair silky, soft and healthier looking. The formula is feather lite and non-greasy. This holy grail has saved my hair. I absolutely love this brand, especially the argan oil range. I have quite fine, medium length hair and the lightweight product did not weigh down my hair and make it limp like most oily products tend to do. To use: Put the tube in a mug of hot water for about 2 minutes to warm the oil and then rub the oil in the palm of your hands and apply to dry hair. I only used half the tube for the bottom half of my hair, about a ponytail length and rolled my hair into a bun. It is recommended to leave the product in for 15 minutes or so, but I left the product for 40 minutes. When rinsing the product out, apply shampoo onto the oil before wetting your hair, this helps to remove excess oil, wash out the shampoo and continue to wash as normal. I find that I don’t need to use conditioner after the treatment. This Argan Oil Treatment is lightweight which absorbs instantly leaving you with frizz free shiny hair without any oily residue. It restored shine back into my hair and my hair felt so silky soft without feeling greasy. It has a lovely, refreshing citrus scent to it. I recommend this product to anyone with dry, damaged hair especially from chemically treated hair or everyday heat styled hair.